The perfect and safe functioning of the powerbars in an aquarium controller system is of essential importance. A malfunction of the powerbar can lead to significant damage of the aquarium, therefore highest production quality and intelligent safety functions are indispensable. 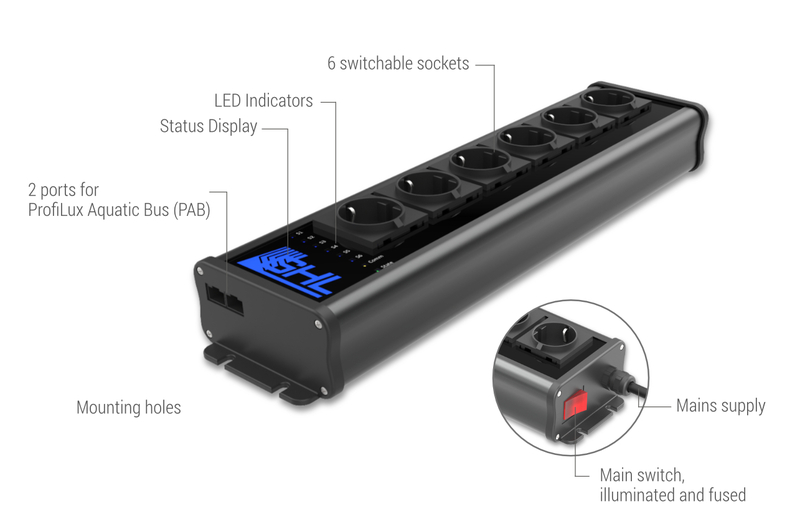 GHL Powerbars feature on/off switching of electrical loads for components such as heaters, cooling devices, solenoid valves for CO2 control, or stream pumps. Our Powerbars are designed specially for the aquarium hobby and produced to the highest quality and security standards. All used components are UL-certified and flame retardant. Mounting holes are conveniently placed on the side or back (depending on the model) for easy installation of the Powerbars on walls or in aquarium cabinets. 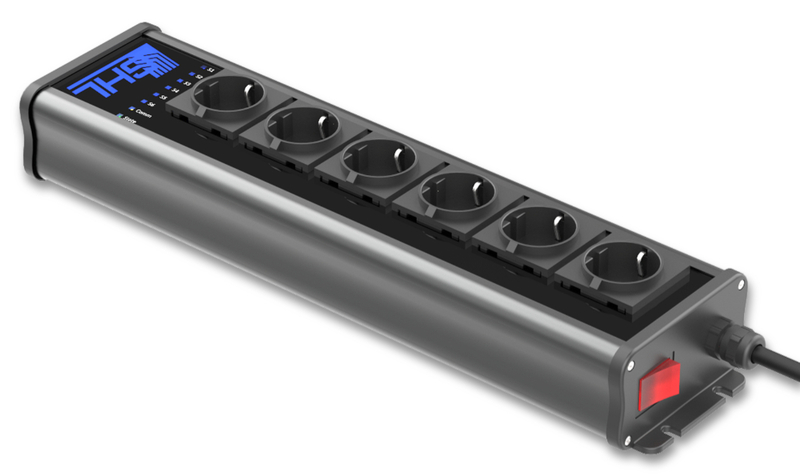 Depending on the ProfiLux model, up to 64 switchable sockets and a maximum of 32 dimmable sockets can be controlled separately. For switching we use in all powerbar models extremely robust and reliable HIC (High Inrush Current) industry-relays instead of cheap semiconductors. These relays are specified for 16 A @ 250 VAC and are able to withstand even up to 160 A for a short while, switching of critial loads such as MH-ballasts, switching power supplies or large chillers is no problem at all. Also the power consumption of individual loads per socket can be measured separately (versions with PAB only). The integrated LEDs indicate the switching status of the individual outlets. Fuses protect the powerbars against overload (depending on version). Our Powerbars are available with the following plugs and sockets: Schuko (Germany, Austria, etc. ), Switzerland, Belgium / France, UK, USA / Canada. The latest powerbar from GHL – elegant design, sophisticated worksmanship and unbeatable quality! The sophisticated design consisting of matt black anodized aluminum and plastic in piano lacquer look makes the Powerbar another outstanding component of the visually appealing GHL equipment. Fallback fail-safe setting: In the event of a communication problem between ProfiLux and the powerbar, each socket takes an user-defined state. Practical arrangement of the sockets: The arrangement in a row and the distance between the sockets make it possible to plug in almost all devices (even bulky power supplies) at any position. In contrast to multi-row powerbars, the single-row arrangement allows simple and tidy cabling. The Powerbar 6E-PAB – like other GHL powerbar models – is available in different country versions. The following versions are currently available: Schuko (e.g. Germany, Austria), France/Belgium, Great Britain, USA/Canada, Switzerland (delivery from May 2019), others on request. The 4-way power strip STDL4-4 switches various electrical consumers such as heating elements, solenoid valves or cooling. The integrated LEDs indicate the switching status of the individual outlets. All sockets are seperately switchable and protected. The digital powerbar Powerbar 6D has its own microprocessor and is bus-compatible (up to 4 Powerbar 6D can be daisy-chained). The microprocessor control offers additional security features. 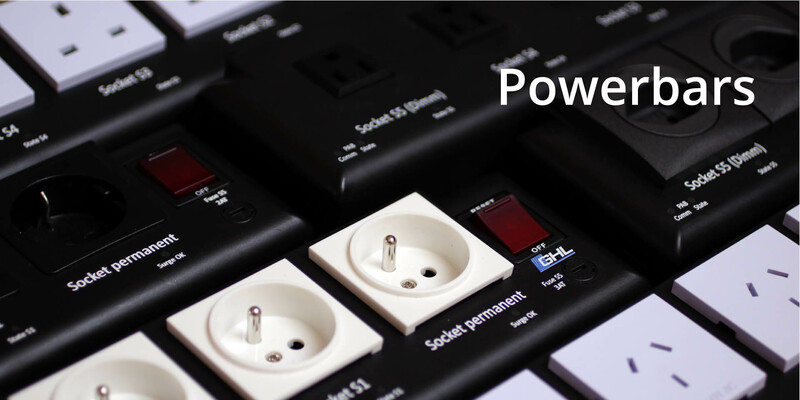 The Powerbar 5.1 offers 5 switchable sockets, one of which can also be dimmed. An additional 6th outlet with permanent power (e.g. for ProfiLux, pumps or lights) is also included. 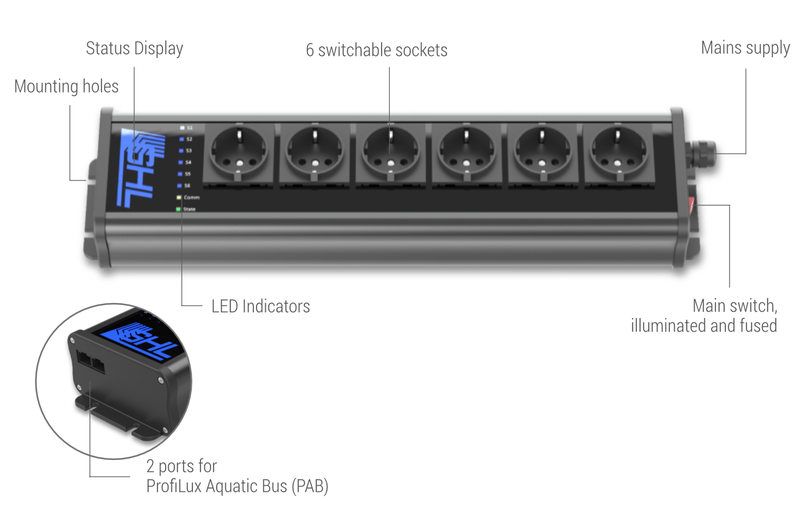 The ProfiLux Aquatic Bus enables secure and reliable communication with ProfiLux. Built-in surge protection and an illuminated fused switch together with LED indicators provide you with the complete package and utmost level of safety. Drawn power of each socket is measured individually. The digital switching module Power Hub–6D–PAB is addressed to professional users and primarily designed for use in control cabinets. 6 circuits can be switched independently, all channels are electrically isolated and switch up to 10 A / 240 VAC. The device is designed for DIN rail mounting and offers screw terminals for the power supply (90 – 240 V, 50/60 Hz) and for relay connections. Drawn power of each switch channel is measured individually.